Stormy Weather – a scarf! … and look what I found! All right, all right – I really didn’t find it. In fact, I made it all by my little self. Not bad, eh? Yarn: Handmaiden Camelspin (70% silk, 30% camel) – 70g total (the skein was 100g/300m). I don’t know the name of the colourway… but isn’t it gorgeous??? if you find out you can score some of this yarn locally, run, don’t walk. Words cannot describe how luxurious it is. despite the relatively thick yarn and large needles, the fabric is feather light, which I hadn’t expected. earlier, when fondling rolling around naked on trying on the shawl, I realised what it is I love so much about lace these days. 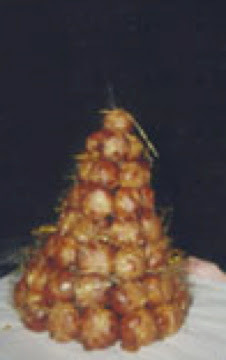 Have you ever had croquembouche?? One of my favourite desserts – I have many fond memories from childhood of Fay’s fabulous creations at the Christmas dinner…the combination of the beautiful crunchy spun sugar and silky smooth pastry cream is unparalled in my experience. And, the lace fabric reminds me of soft spun sugar. Hmm. …with minimal effort and not all that many pins. Get some today! Nothing to report this evening, news (or fearmongering) wise. The only news is the weather this weekend, apparently. Nothing else is happening of any consequence anywhere in the world. They have been showing the same cars driving sideways on some highway in West Virginia since Friday night… I’m writing this Sunday night. Why restrict the accident coverage to West Virginia of all places when we live in Toronto?!? I wish they would show video of the guy who nearly ran me over earlier today on Bathurst while yakking on his cell phone and driving way too fast! And run a public shaming campaign while they’re at it. Where was I? Oh yeah – time to stop rambling and start working on the Secret of the Stole II go to bed so that I can get up and go to work tomorrow. Gotta pay for all this yarn lusciousness somehow! sunflower tam and headgear madness!